For as long as Orrie could remember, he wanted to learn to horseback ride. He heard about other children with physical disabilities riding horses, but he had never visited a program where children who used wheelchairs learned to ride well enough that they eventually could ride horses on their own. Orrie’s mom and dad had spoken to Orrie’s doctor who felt that the motion of the pony as it walked and trotted would be good exercise for Orrie’s legs. As the doctor put it, “Riding would be very therapeutic for you, Orrie.” Great, thought Orrie, the doctor is all for it. Now I have to find a Therapeutic Horseback Riding Program I can get to and my parents can afford. 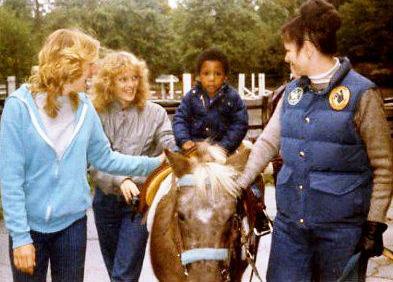 There were no Therapeutic Horseback Riding Programs on or near “Can Do” Street. So, Orrie got on the Internet and found a program about 50 miles away. When his birthday rolled around in May, he asked Grandpa John to take him to see the program as his birthday present. The two of them set off one Saturday morning. Before they knew it they were there! The Unicorn Therapeutic Riding Program rents space at a beautiful riding center with an indoor and an outdoor riding area. The program accepts children as young as three. The Unicorn Program has ponies for the little kids and horses for older kids and adults. There are 3 certified riding instructors leading classes, a physical therapist and an occupational therapist on-site whenever the program is in session. There are also three volunteers for every rider; one leads the pony or horse around and the other two serve as side-walkers to make sure the rider was safe at all times. Orrie watched as a little boy took a lesson . One of the instructors let Orrie sit on Oatmeal, the pony, and go for a brief walk around the ring with a leader and two side walkers. He was in heaven! The lessons are free. They are supported by donations from generous people. Orrie kept thinking that there had to be a way to get there. Grandpa John knew what he was thinking and said,”Orrie, we need to think about how you can get to the Unicorn Program. I don’t think I can take you every week. Grandma and I have the store to take care of. Your dad works weekends and your mom has three other kids to take care of and get to activities. A cheer went up for Orrie and Mr. Markle handed him a check for 300 dollars. Orrie couldn’t wait to get home and tell his family that wishes can come true! Why Did Kathy Fall Asleep in Class? Why did Kathy do it again; why did she fall asleep in class? 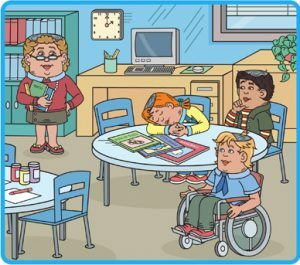 Did you ever fall asleep in class? The boys were snacking with Grandma Hattie but she was wondering if Willie did his chores. These were not the answers Willie wanted to hear. “Oh, that’s an easy one,” said Hector, “It’s my room, I messed it, I should clean it up.” Orrie nodded yes. He feels the same way. Grandma smiled. Hector turned to Orrie and said, “Can I see the game? I don’t have any chores until after dinner.” Orrie spun his chair around. He and Hector helped grandma clear the table. Then they each gave her a big hug and a thank you and off they went. Do you do your chores when you are asked to do them? 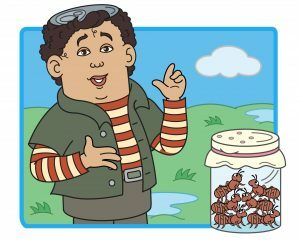 Hector’s idea to take ants to an indoor picnic is about to get him in trouble big time! It is sure to be fun what with all those ants!